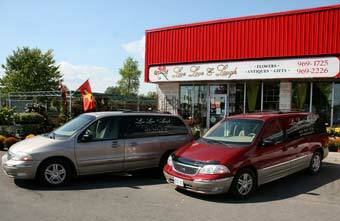 Live, Love and Laugh Flowers, Antiques and Gifts Inc. is a family owned and operated full service flower and gift shop. We have been proudly serving Belleville and the surrounding area since 1995. We have also been operating our year-round Christmas store "Christmas in the Village" since 2010. We are open 7 days a week. Using our own fleet of delivery vans, we are able to provide prompt and continuous same day service. Live, Love and Laugh designers use the most unique and spectacular fresh flowers, including Ecuadorian roses, to create both Traditional and High Style designs. Live, Love and Laugh specializes in flowers for all life's special moments...today, tomorrow and forever. Winner of the Readers' Choice Award for Favourite Florist for 2006, 2007, 2008, 2009, 2010, 2011, 2012 and 2013! Winner of the Readers' Choice Award for Favourite Garden Centre for 2009, 2010 & 2014! Live, Love and Laugh Flowers, Antiques and Gifts Inc.
Winter hours in effect January 2-March 18. To help assure on-time delivery during the busy holiday season, place your order at least 1 day prior to the following major holidays: Thanksgiving Day, Christmas Day, Valentine's Day, Family Day, Easter, Administrative Professionals Week, Mother's Day. Our shop will always be closed on the following holidays: Christmas Day, Boxing Day, New Year's Day, Family Day, Canada Day, Labour Day and Thanksgiving Day. Ameliasburg, Belleville, Brighton, Bloomfield, Cannifton, Carrying Place, Corbyville, Demorestville, Deseronto, Foxboro, Frankford, Madoc, Marmora, Marysville, Picton, Plainfield, Point Anne, Roslin, Rossmore, Shannonville, Stirling, Trenton, Tweed, Wellington and Stirling. Expanded Aug 1, 2010, we invite you to visit our "Christmas in the Village" Year-round Christmas Store located right beside our current location at Reids Dairy Village, Belleville. We have been creating the most beautiful Christmas Room for 6 years and to give us more room with a bigger selection of Christmas trees and trimmings we have expanded to a whole store dedicated to Christmas. Christmas in the Village is open YEAR ROUND for your early and late shopping convenience! Over 30 trees decorated all differently with over 30 different themes! The tree themes are changed twice a year.. once in August for the holiday season with new trimmings added and then again in March with what is left over from the previous holiday season to create an ALL NEW look! We specialize in the following services: all day "anytime" delivery, a large inventory of fresh flowers, fresh cut Tropical Blooming Plants, Tropical Plants, European/dish gardens, Contemporary and traditional arrangements, High-style floral arrangements, Silk Stems, Weddings, Large Event and Corporate Design and Funeral designs. We also carry extensive gift lines such as Rapz Wear clothing, Michel Design Works, Inis, Walton Wood Farm, Natural Inspirations, Rue de Marli, Barefoot Venus, Lampe Berger and baby gift lines. Our gourmet lines include Rogers' Chocolate, Sprucewood Cookies, Terry's Toffee, Grills Orchard Fudge, Ma's Kitchen, Gourmet du Village, Stonewall Kitchen, Frontier Soups and more. We carry greeting cards such as Blue Mountain and Palm Press. We also carry high quality candles such as Root Candles, WoodWick and Bridgewater Soy Jar Candles. If you have any questions or need more information, please contact us by e-mail at liveloveandlaughflowers@outlook.com ; or call us directly at (613) 969-1725. We are always here to help you and to make your flower-sending experience enjoyable. 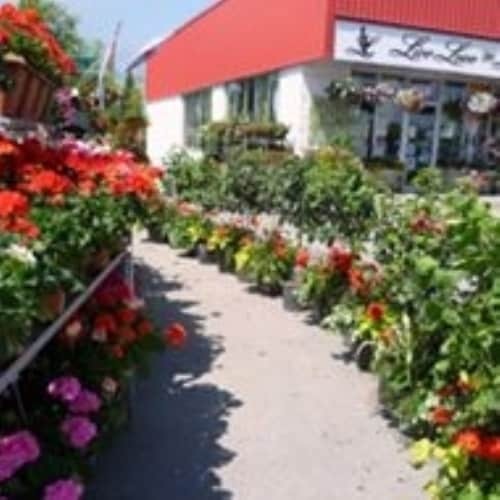 Live, Love and Laugh Flowers offers same day delivery to the Belleville area with an in-town 16.95 delivery fee leaving at 10am & 2pm (special exceptions for funerals) We deliver to all nursing homes and seniors residences, the Belleville General Hospital and all Funeral Homes. We also deliver to the following locations, however same day delivery cannot be guaranteed unless the order is received before 2:00 p.m. Seasonal and regional conditions affect the supply and cost of flowers and greens. Specific varieties or colours may not always be available or meet our quality standards. In some cases, substitutions may be necessary to fulfill your floral and container requirements. This privacy statement has been created in order to demonstrate our firm commitment to protecting customer and staff privacy.